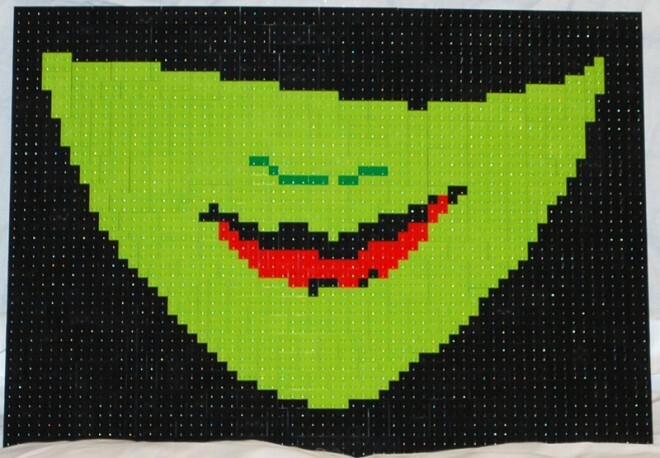 I’ve not seen the musical Wicked , but when I saw a poster recently I was struck at the similarity of the green on the poster and LEGO’s shade of lime green. And it seemed that the Ides of March was a good day to post something “wicked.” So, here is a bit of an iconic stylization of part of the poster. I think Wicked and Broadway fans will find it recognizable. By the way, you may notice I’m on a bit of a “green kick.” Two weeks ago it was Green Eggs and Ham, and I’ve got another “green” mosaic to post on Tuesday (appropriate for St. Patrick’s day). Note: The Musical, Wicked is based on Gregory Maguire’s New York Times Best Selling Wicked: The Life and Times of the Wicked Witch of the West, a retelling of L. Frank Baum’s The Wonderful Wizard of Oz, giving more back story to the whole Oz thing and telling you what “really” happened, according to the author. As a NYT Best Seller I would caution that the book is not suitable for and not intended for children.